Twelve Faced Rudraksha or Dwadash Mukhi Rudraksha has twelve natural lining on its face. This bead is generally found in oval or round shape. 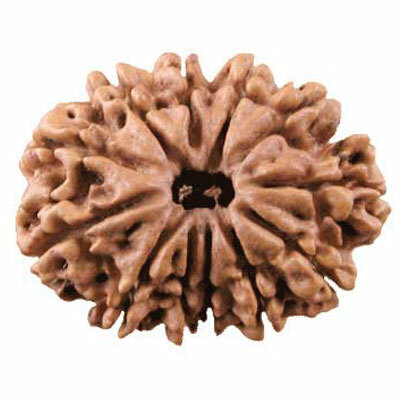 The deity of this Rudraskah is Lord Vishnu and this Rudraksha,s ruling planet is Lord Sun. It has been observed that due to adverse placement of Sun in the chart, a person gets weak aura which further causes weak immune power. Such persons fail to cope with the hardships of life. They lack confidence and fail to hold the key position in their life. Twelve Faced Rudraksha removes all the malefic result of such placement of Sun in the horoscope. Like Sun, he can become full of energy and force. The wearer develops a powerful aura around him which helps him to protect from many obstacles. If he holds administrative position in his job, he can successfully hold and manage it. Politicians and businessmen are also advised to wear Twelve Faced Rudraksha to get success over their enemies and get fame in their respective field along with wealth and prosperity. Due to weak aura, a person easily catches various diseases. These diseases, which are related to weak Sun, include weak digestion, mental depression, weak heart and other heart related problems, weak bones and osteoporosis etc. This bead helps in minimizing these problems. This bead also cures skin diseases. This bead should be worn around neck in red thread. To get the maximum benefits from this bead, the above mantra should be chanted 108 times (One rosary) daily. The auspicious day for wearing this Rudraksha is Monday.